Generally, even strains that combine a Sativa and an Indica background tend to lean heavily towards one side or the other in both genetic background and effect. However, Candy Kush Express FAST Version is unique even amongst Indica/Sativa hybrids: at 40 percent sativa and 60 percent Indica, this Kush strain is about as close to a true, evenly mixed hybrid that there is available. This translates to a unique blend of both Indica and Sativa effects. The Sweet Special strain is part of Candy Kush’s direct genetic background. Among other things, this strain is known for a sweet taste and hearty, durable plants. These assets translate to Candy Kush, as the plants are physically sturdy for growing indoors or out, and the taste is always pleasingly sweet. The legendary Royal Kush is the other genetic parent of Candy Kush. Royal Kush is a famously Indica-heavy strain, being descended itself from the inexpressibly potent Afghani Kush. Both Afghani and Royal Kush are prized amongst insomniacs for their sedative effects, and more casual and/or recreational smokers note the heavy “couch-lock” present in these strains. Since this strain does have slightly more Indica in its genetic background, a strong physical stoniness is present. However, the Sativa element of this strain shows itself in a heady, soaring euphoria. The Sativa aspects of Candy Kush help balance the effects, giving the soothing effects an unusual yet welcome energetic quality. This variety is gaining popularity for its unique blend of uplifting and deeply relaxing effects. The most effective medical uses of this strain are stress and pain relief. The low CBD content helps regulate the sedating effect, meaning that this strain has the capacity to relax without completely knocking users out. It is notable that even with low CBD, the THC content of this strain weighs in at a very hefty 18 percent, making it one of the more potent varieties available. If grown outdoors, these plants yield at least 450 dried grams or up to 500 grams per plant if grown outdoors, or 475 to 525 dried grams when grown indoors. Since this is a Fast Version flowering takes only seven weeks. When growing outdoors it is best to schedule for an early September harvest. When fully grown, the plants will reach a height of up to 100 centimetres indoors, or up to 170 centimetres outdoors. Like all Fast Versions, these Candy Kush plants make for an easy growing process. Even novice growers will find that it is surprisingly easy to quickly yield dense, high-quality buds with through a straightforward growing process. 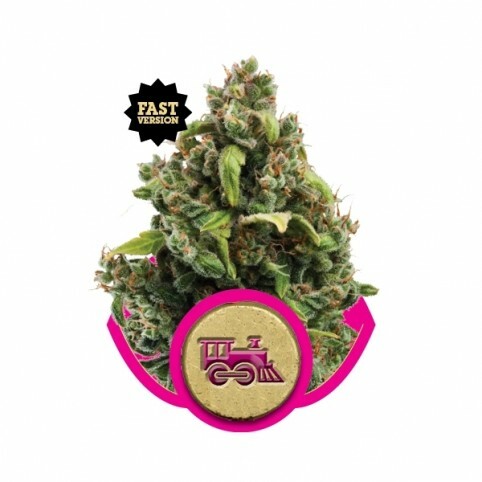 Candy Kush Express FAST Version is ideal for growers who are interested in an unusually balanced strain that is easy to grow quickly in either indoor or outdoor conditions.